This giveaway is now closed…. but please scroll down to see the Cubed Steak recipe. One of my favorite foods is cubed steak. There is nothing better than a tender cubed steak cut into small bite sized pieces and dipped into homemade mashed potatoes…. When the nice folks at Shirley J’s asked me if I’d like to give their beef slow cooker ﻿seasoning a try I immediately knew it would be the perfect accompaniment to the cubed steak that one of our neighbors had given us from the beef they had raised and processed (to me there is nothing like farm raised meat… DELICIOUS!). 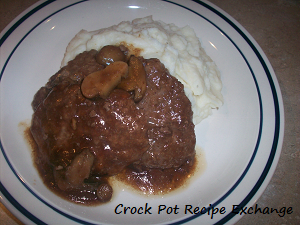 What was so fantastic about this crock pot cubed steak with mushroom gravy was that all I had to do was add water to the Shirley J seasoning and pour it on top of the cubed steak and mushrooms. That’s it. It was that easy. What resulted was THE most delicious cubed steak we’d ever eaten. There was no need to guess at how much salt or pepper to add. The flavor of the Shirley J beef slow cooker seasoning was perfect. There was also no need to thicken the gravy… the seasoning made it’s own! 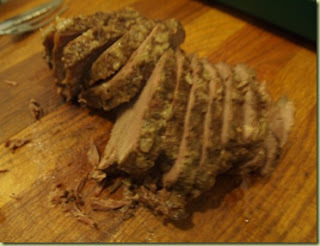 Place the steaks in the bottom of a 3 – 5 quart slow cooker. 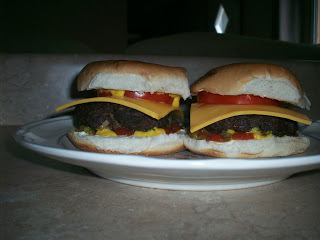 Evenly distribute the mushrooms over them. Mix the Shirley J seasoning with the water and pour on top of steak and mushrooms. Put the lid on and cook on low for 6 – 8 hours or on high for 3 1/2 – 5 hours. This was so delicious that everyone went back for seconds. The only complaint was there was not enough for thirds! I definitely can’t wait to try this Shirley J beef slow cooker seasoning in more crock pot recipes. 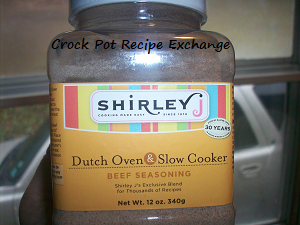 MANDATORY ENTRY:Leave a comment below telling us what crock pot beef dish you would love to make using the Shirley J Beef Slow Cooker Seasoning. 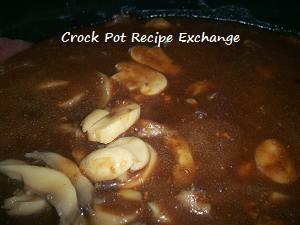 Like Crock Pot Recipe Exchange on facebook and leave a comment below that you have done so. 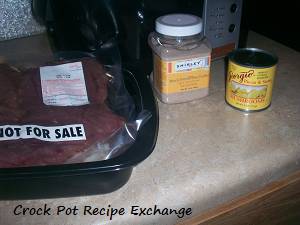 Follow Crock Pot Recipe Exchange on twitter and leave a comment below that you have done so. 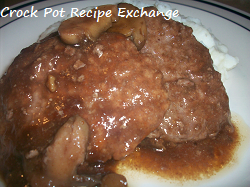 Follow Crock Pot Recipe Exchange on pinterest and leave a comment below that you have done so. Like Shirley J on facebook and leave a comment below that you have done so. Follow Shirley J on twitter and leave a comment below that you have done so. If you can’t wait see if you’ve won go here to purchase now. **NOTE** Make sure you leave your name and email address with your comment so I contact you and alert you of your win. The giveaway will end on Monday, December 5, 2011 at 11:59 PM EST. A winner will be named the following day. You must be 18 years old to enter. This is for continental US residents ONLY. The opinions expressed in this review are mine and mine alone. I was compensated no monies for this review, but was given a 12 ounce container of Shirley J Beef Slow Cooker Seasoning in exchange for a review and hosting a giveaway.